Since I hadn’t managed to get together a group of 4 to climb Putauaki I decided to join the race. The main conditions for entry are that you can reach the top turnaround point within 2 hours 30 minutes, and finish within 3 hours. 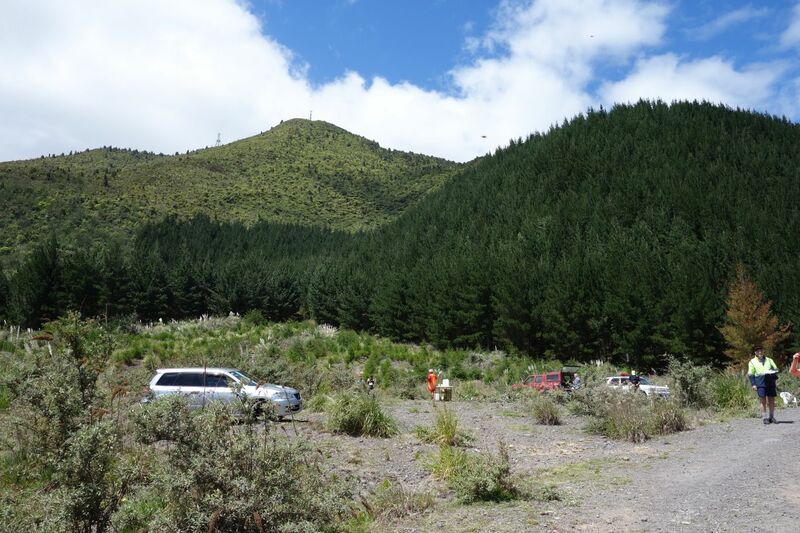 Anyone not reaching the summit in time will be driven down by 4WD on the access road, but timing at the finish line does continue even after 3 hours. 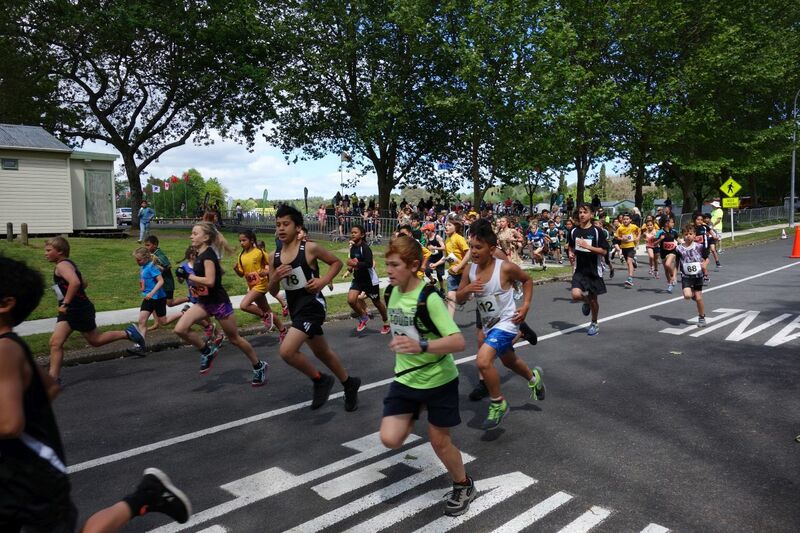 Start and finish is at Firmin Field on Waterhouse Street, with the main race starting at 12:00. In 2016 all participants reached the top point within 2 hours, but a few did take just over 3 hours to reach the finish line. 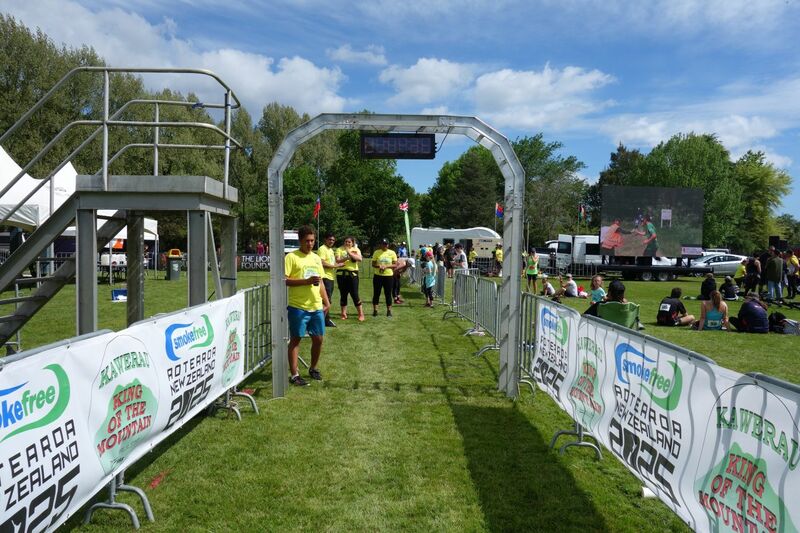 The fastest runners complete the course in well under 1 hour, with a new record of 45 minutes 31 seconds being set in 2016. The race uses separate tracks for the uphill leg and the downhill leg. The uphill leg apparently follows the normal track to the summit for most of the way, whereas the downhill leg is a very steep and slippery specially constructed track heading more or less straight down the side of the mountain. The start is about 40 metres above sea level, with the highest point reached on the run at about 780 metres. 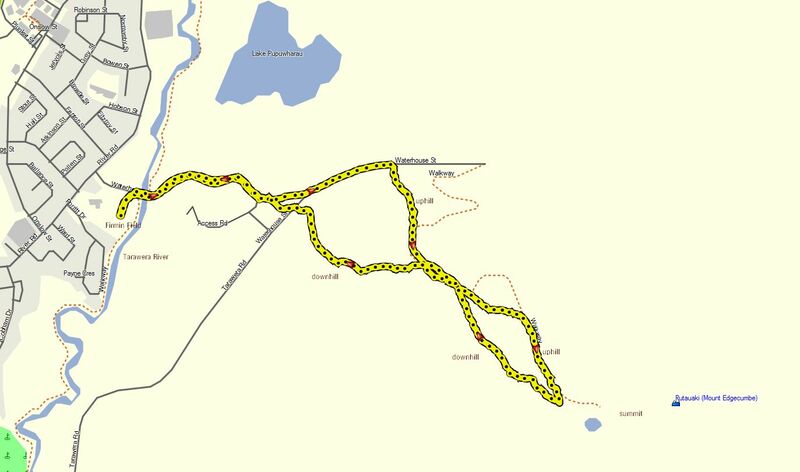 Total distance is about 7 km. The lower part of the mountain is covered in pine forest, with the upper part covered in mostly low scrub and bushes. 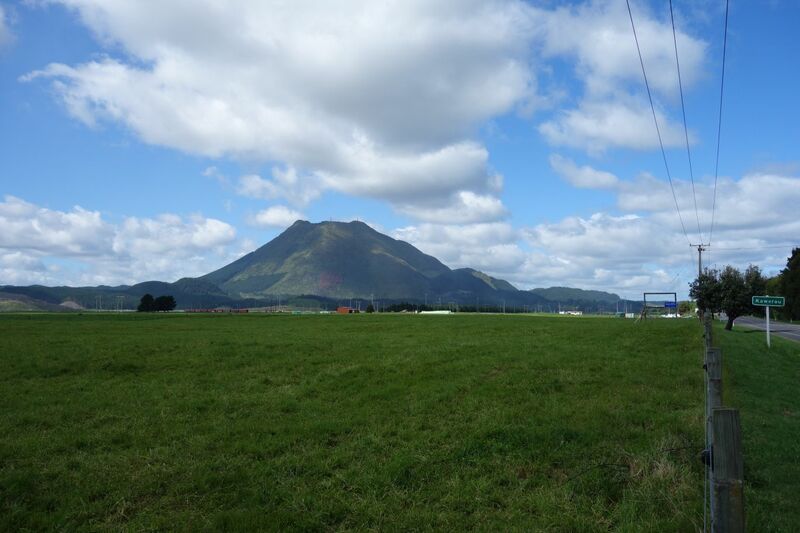 Putauaki (Mt Edgecumbe) is clearly visible from almost everywhere on the Rangitaiki Plains. 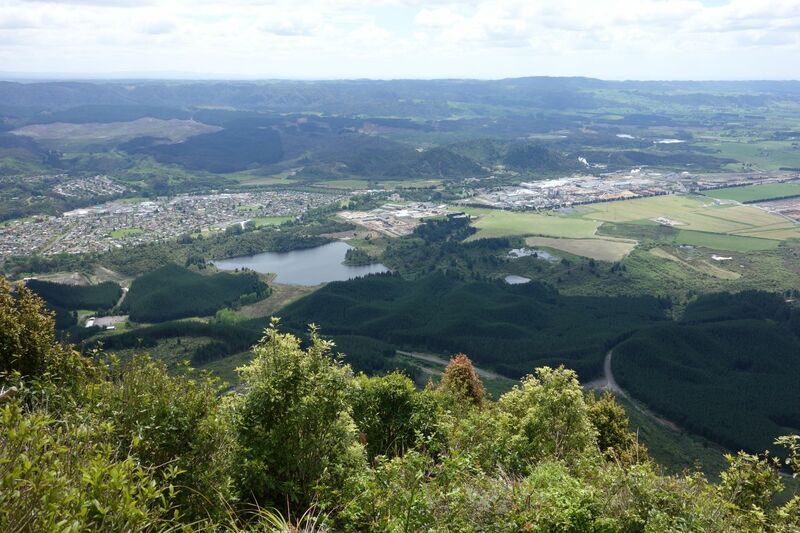 Entering Kawerau from the north it is very prominent. 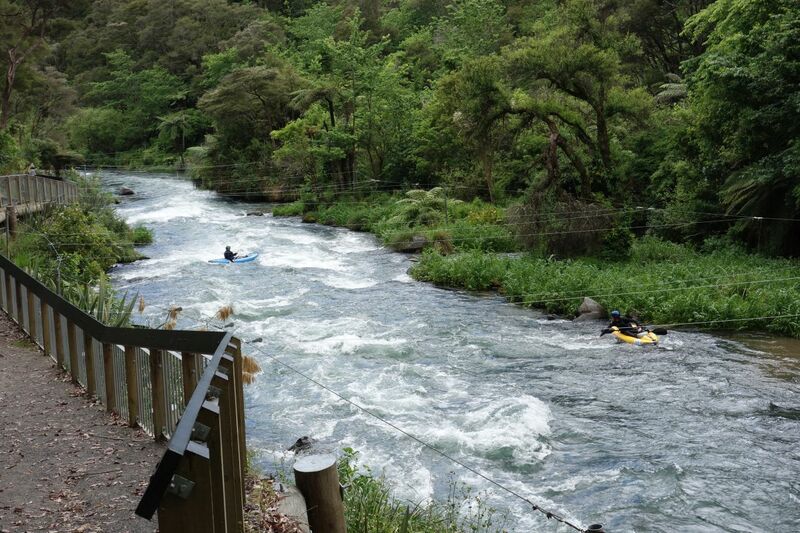 The Rangitaiki River runs alongside Firmin Field and the adjacent Waterhouse Street Reserve, and is used for white water rafting and canoe slalom events. 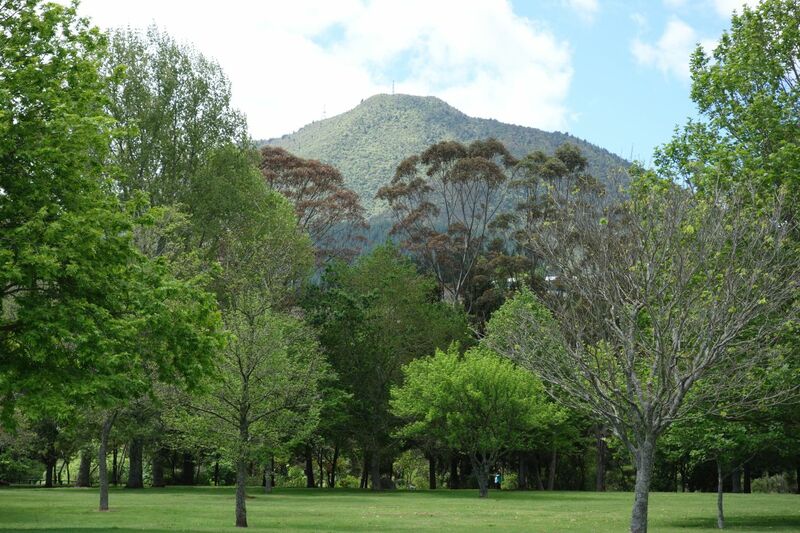 The summit of Putauaki seen from Waterhouse Street Reserve, near Firmin Field. Before the main race there is a Prince and Princess race for schoolchildren held over a much shorter course. 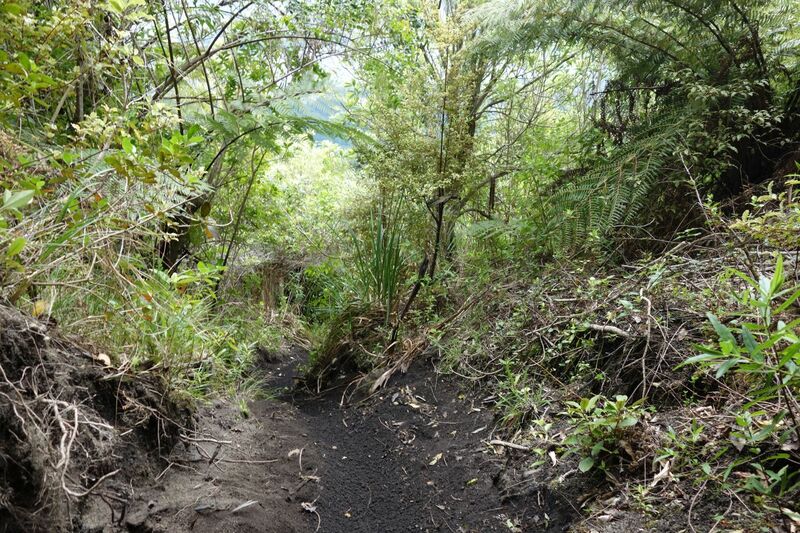 Here leaving Firmin Field and heading up Waterhouse Street across the Tarawera River. Firmin Field before the main race. A huge video screen, seen from the back at the far right, screens live coverage during the race. Photographers and videographers are located in several places along the route. Drink stations along the route provide water to the participants. This one before the start of the more serious climb through radiata pine forest. The transmission towers at the summit can be seen at the top. 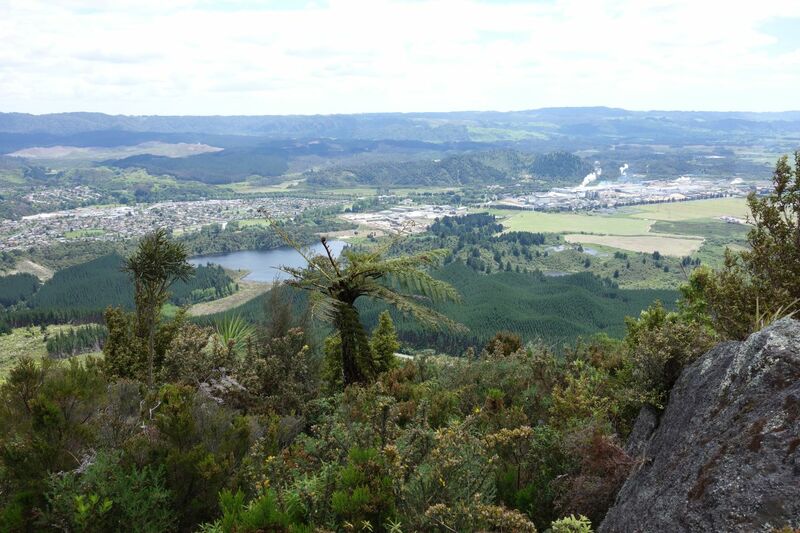 Looking back down the mountain the pulp and paper mill and industrial area can be seen to the right, with the township of Kawerau left of centre. Firmin Field is hidden behind the low hills on the far left. 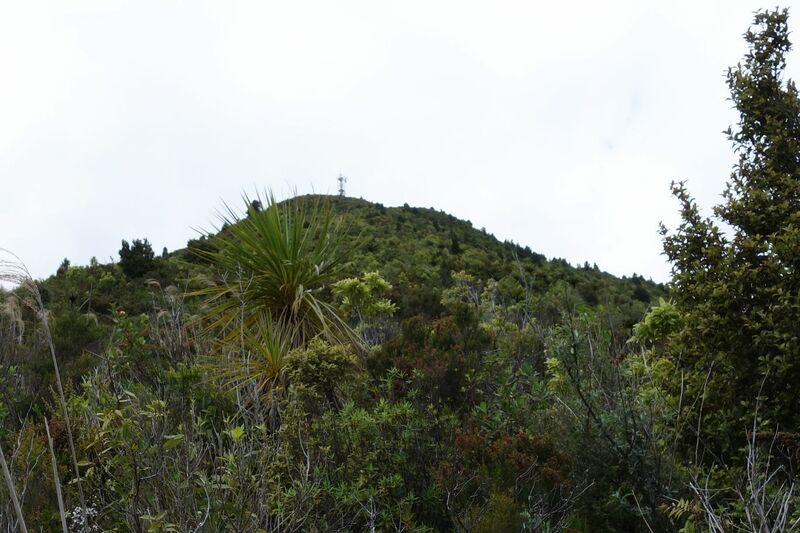 The first glimpse of the summit after climbing through the pine plantation. 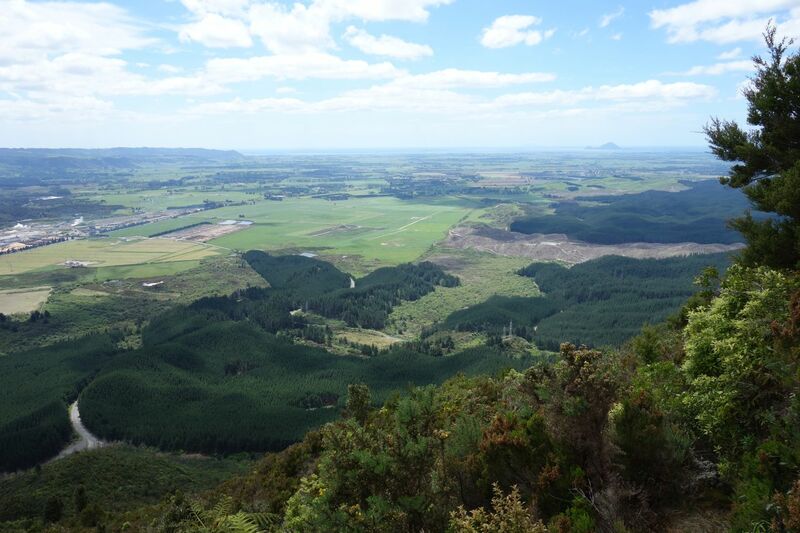 This is at an elevation of about 465 metres, with more than 300 metres climb still to go..
Another 50 metres higher up and theres a good view across the Rangitaiki Plains to the Bay of Plenty, with Moutohora (Whale Island) prominent to the right. Almost at the highest point of the race, at about 730 m asl, this is the view of the town, mill and industrial area. 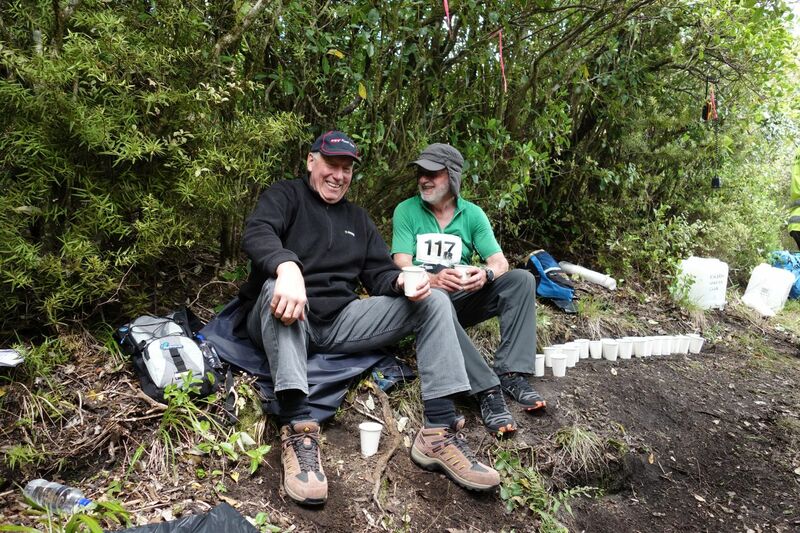 A competitor taking a drink of water, having a rest, and chatting with the recently re-elected mayor of Kawerau, Malcolm Campbell, at the highest point. The mayor stayed there for the whole race before driving back down and helping with the presentation ceremony after the race. Much of the downhill leg is very steep and slippery scoria, and could be done by crouching right down and using the shoes as skis. Wearing a pair of gloves could be recommended to avoid scoria rash. The last checkpoint and drink station before the finish line. 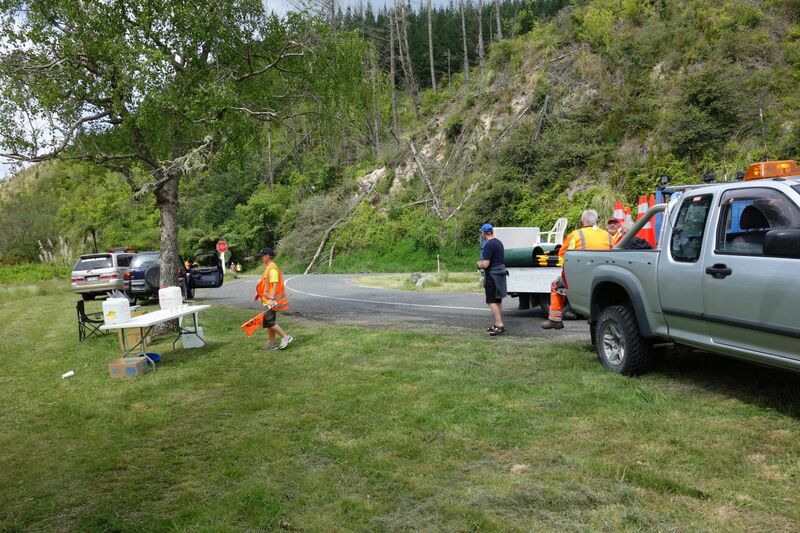 All the volunteers do a great job to keep the whole event running smoothly and safely. 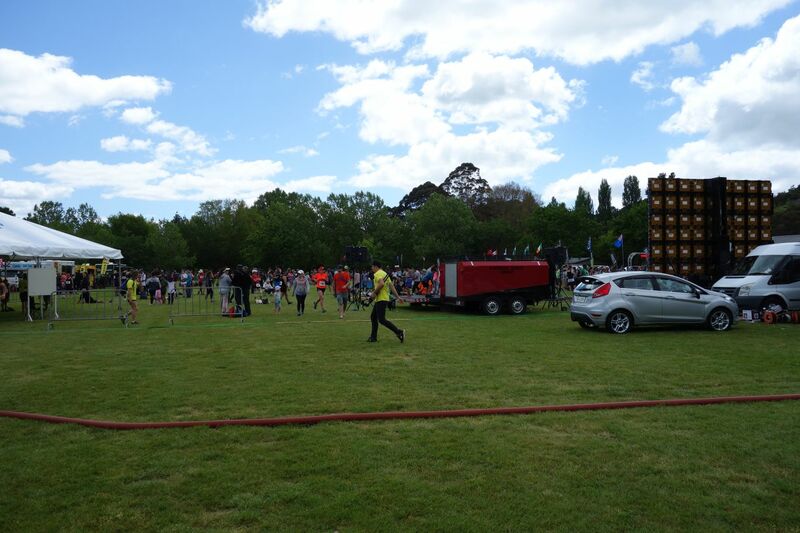 The rescue helicopter was on standby, and was used for dropping off water at a couple of the drink stations. Ready to cross the finish line as the last one home, at just over 3 hours 6 minutes. The prizegiving ceremony after the race. 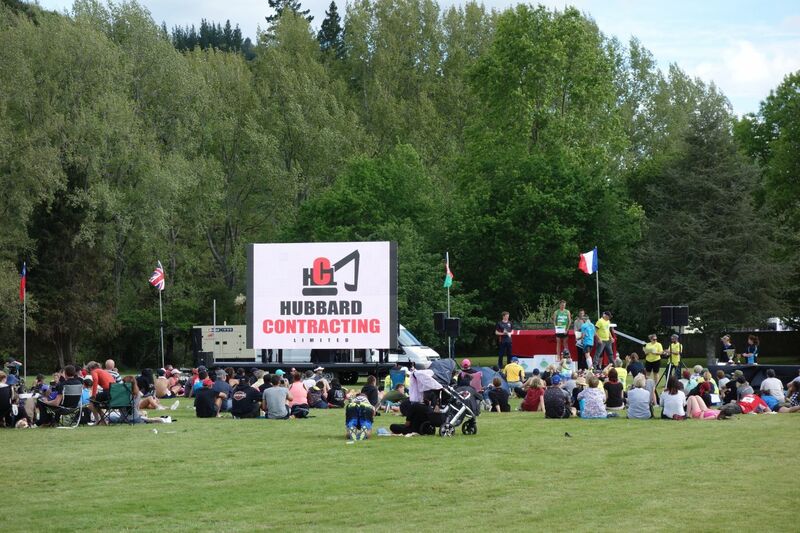 The large advertising hoarding is actually the video screen used during the race to show live coverage of the event. 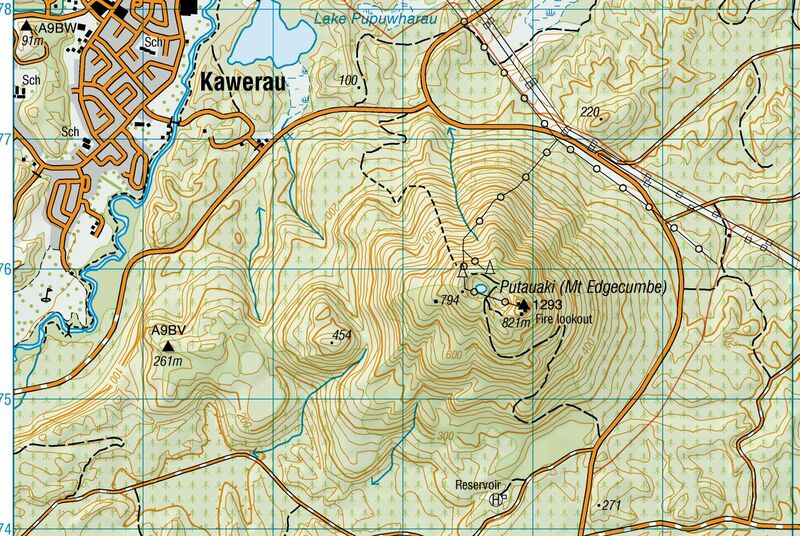 The GPS tracklog shows the route followed, starting from Firmin Field on the left and turning around near the summit of Putauaki on the right. A topographic map of the same area as shown on the GPS tracklog. The steepness of the climb is clearly visible with the close contour lines above about 300 metres above sea level. 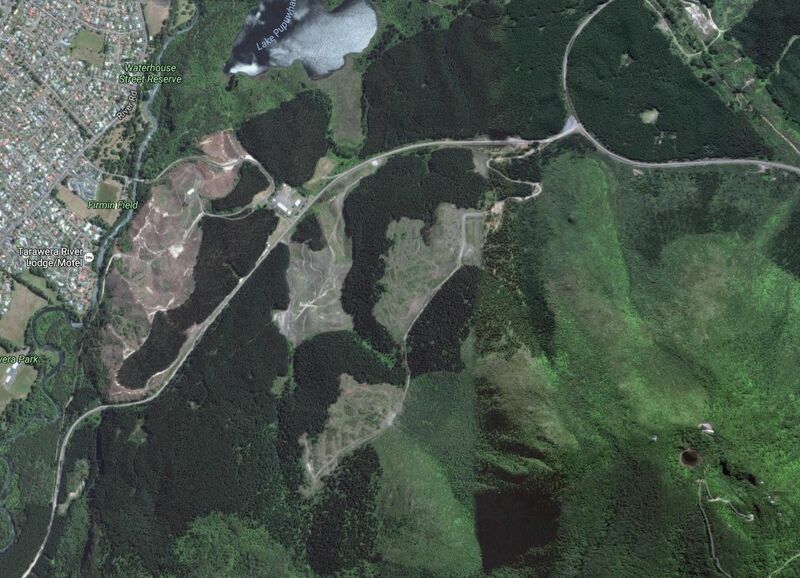 A satellite image, from Google Maps, of the same area as above. The crater lake at the summit is in the lower right corner. The race was walked on October 29, 2016.